If you are an avid reader of liner notes like I am, it is always gratifying to see the names of Dennis Collins or Alfa Anderson pop up on the list of background singers like on Valerie Ghent‘s new album “Velours”. Dennis Collins, for example, has recorded with just about everyone from Roberta Flack to Donald Fagen, from Aretha Franklin to Luther Vandross. He can be heard as a solo guest singer on Melba Moore‘s 1986 “It’s Been So Long” track (from her “A Lot Of Love” LP). Alfa Anderson of course was one of the lead vocalists of Chic (it is her solo on “I Want Your Love” and “Le Freak”, the latter with Diva Gray), and also graced a million more albums with her voice, most notably those of Luther Vandross, Teddy Pendergrass, or Jody Watley. Now Valerie Ghent is no newcomer either, having performed and recorded with Ashford & Simpson for over two decades, as well as for Roberta Flack, Nina Simone, or Peabo Bryson. 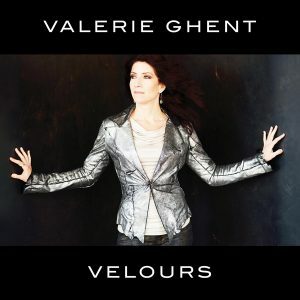 Valerie’s sixth album was recorded in France and New York, mastered by Greg Calbi (another prominent name) and is a two-sided affair. I’m really digging the first three cuts of her album, beginning with the lush and gentle, easily flowing groover “Love Divine”, where Valerie’s emotive voice is perfectly displayed. “It’s Got To Be You” is an extremely soulful, jazzily swaying midtempo cut with those magical backing vocals. And then there’s “New York City Streets”, right out of the 70s/80s Luther meets Ashford & Simpson period with a driving piano lead and Alfa and Dennis (together with Keith Fluitt) bringing back those inimitable Chic and Luther Vandross moments in the super-slick hook, supported by a cool horn section. A real gem! Valerie’s songwriting prowess can be witnessed on the grandiose ballad “Light On My Life” which is too syrupy for my taste. I can’t help it but I was never a big fan of reggae (and this is not because a lot of the reggae artists are sick homophobes), and here, Valerie comes up with two reggae cuts, one of which, “On & On”, at least has Alfa and Dennis on vocals again. The other (“Phased”) has some cool synth and harmonica and a fair enough hookline. I also think that the pretty funky “Get Funkay” doesn’t suit her and her vocal gymnastics on this one. She sounds much better, more at ease and comfortable on the soulful side of things, like the elegantly grooving title track, one of the best bets on the album. We also get another well-written ballad (the soft “Linger” with a sweet cello by Dave Eggar plus violin and viola) and a solid and brassy “30 Days”. But Valerie really shines most on cuts like the album closer, “Love Will Keep Me Strong”, a strong soul tune creating a juicy and intense atmosphere. And for those liner notes readers: Tinker Barfield, Bashiri Johnson, Steven Bernstein, and Briggan Krauss, among others, are on the album as well.